I tend to avoid reading message boards, social media and Reddit as much as I can mostly because they are incredibly addicting and I end up wasting tons of time that is much better spent combing the parasites out of my hair. Over the last week or so I’ve fallen off the wagon and been noticing that there is a large number of ebike builders and buyers that are not using the right sized pack or BMS for their particular ebike builds. 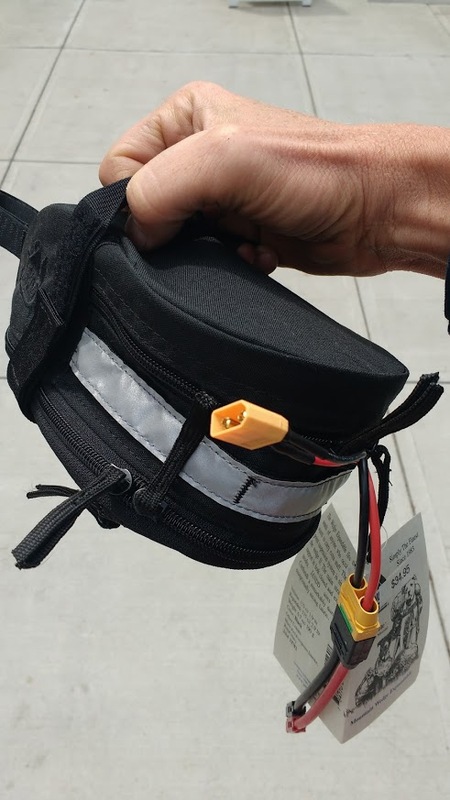 This article is dedicated to all of you people who are wondering why you just can’t seem to get the power & performance that you think you’re supposed to be getting out of your ebike and why that might be happening (spoiler alert: your pack is too small). One of my pet peeves with the ebike industry is when they put a pack together with a BMS that allows more amps to be drawn from the pack than what the cells are really rated for. Let’s talk about 18650 ebike packs. A standard 48v pack is a 13S pack which means there are 13 groups of cells in series that produce about 3.7v nominal. When the cells are fully charged that number is closer to 4.11v per cell grouping but I digress. A 52v pack is a 14S pack which has 14 groups of cells in series. These numbers have little or nothing to do with the amps that a pack can put out. I prefer the 14S packs because when they get run down they still produce a pretty high voltage so your motor doesn’t feel like it’s dying when the pack is nearly dead. This article will only talk about 14S 52v ebike packs because 90% of my packs are 14S. What really matters for how many watts you can pull out of a pack is three things. (Cell Peak Amp Draw) x (pack P number) The P number is the Parallel number of cells in each cell grouping. The number of cells in a pack is the S (series) number times the P (Parallel) number. This is where things get a little confusing. Let’s say you bought a Lunacycle 30Q mini cube that is 6Ah. The 6Ah is the total power capacity of the pack but has nothing to do with how much power you can draw at any one time. Instead, you have to look at the 30Q Peak Amp draw (15 Amps) x the pack P number (2P) which gives you a total of 30 Amps. Will the pack put out more than 30 Amps for short several second bursts? It can, but in doing so you are putting a huge stress on the cells and the BMS. Although the product description for this pack here says it can do 50 Amps burst that is not entirely true. 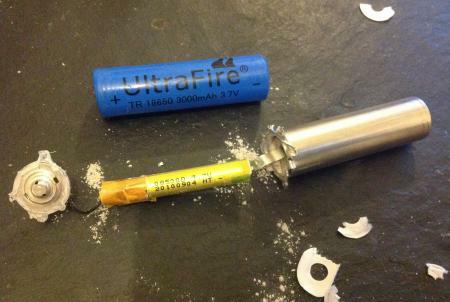 You would be crazy to run a tiny 3lb 2P pack and expect it to put out that much power for more than a few seconds. I have run the 30Q 2P mini cube pretty successfully with both the BBS02 and the BBSHD drive unit, but I would never pair it with a 50 Amp BBSHD Ludicrous controller. If I did use a 30Q mini cube with a Ludicrous controller I’d never touch the throttle and instead would only use the middle to lower PAS levels which would assure that I would never pull more than about 1500 Watts of power (under 30 Amps). I love dangling my 3lb 30Q 6Ah pack under the seat and it is perfectly happy with the BBS02 or BBSHD. It’s the stealthiest battery I own by far. Let’s talk shark packs for a minute, a 5P jumbo shark GA cell shark pack will be able to put out 40 Amps cont (8Amps x 5P) but the BMS is limited to 30 Amps continuous. Most frame packs are 4P so a PF frame pack will put out 40 Amps cont (10Amps x 4P) but again you’re going to be limited by the BMS. You can push the BMS on these packs up over 40 Amps for a few seconds (less than 10) but in my opinion, it’s a dangerous habit to get into. I don’t know of anyone who has successfully fit a BMS that is larger than 30 Amps continuous into any frame pack due to the size constraints of the cases. One of my pet peeves is the PF 6ah and GA 7Ah Mighty Mini Cubes from Luna. These are tiny 3lb 2P packs with 30 Amp Continuous BMS’s. I would never release a battery like this because the continuous rating for the cells (16 for the GA 8Amps x 2P) (20 for the PF 10Amps x 2P) is much lower than the continuous rating of the BMS. This is one of the biggest Endless Sphere complaints about some Lunacycle packs, but to be fair these are currently the only two packs Lunacycle currently sells that the cell rating is far below the BMS rating. As long as you’re aware that the continuous rating for the cells on these packs is much lower than the BMS rating then you can use them accordingly and will probably not destroy them. If you throw either of the GA or PF cube and run them on an ebike at 30Amps continuous for 15 minutes straight then the packs are going to go into thermal shutdown mode. If you abuse these packs like that on a regular basis then there is no way you’re going to get a full 400 cycles out of them. If you’re running a Ludicrous controller with a frame pack then you’re castrating yourself. You’ll only get half of the continuous power that the Good Lord Lucifer wanted you to enjoy. Even on the highest PAS setting, the BBSxx drive units will only access about 50% of the peak power as long as you’re not on a steep hill. I find that the BBS02 will run consistently at around 750W with a 52T front ring on it which on my 26″ mountain bike will give me a steady speed of about 25mph without ever touching the throttle. Since the motor’s nominal rating is 750W that makes a lot of sense. 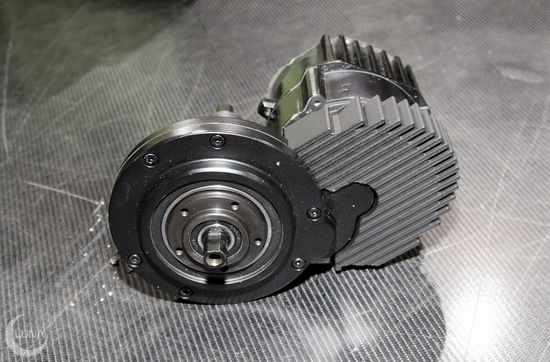 The peak rating for this motor is about 1200-1300W depending on the battery voltage. On the BBSHD when using the PAS level it rarely gets over 1000W if you’re riding on the level which is much lower than the 1500W that the BBSHD can run at all day long at full throttle. This means that the motor will pull about 20Amps continuous at the highest PAS level 9 as long as there is no hill. I find that with a big front chainring that will net me an average speed of about 30 mph using PAS alone, although with the throttle you can go a bit faster than that. While the BBS02 will overheat with full throttle for extended periods (several minutes at a time) the BBSHD can be run at full throttle at any temperature and any hill with relative impunity. The Ludicrous controller is an animal of another color. If you’re running it at the 50 Amp setting from the Luna factory then the controller really peaks out at around 47Amps or so on full throttle. If you run the BBSHD at full throttle for extended time periods you will likely cause something in the drive unit to fail. If you use PAS only then you’re looking at about 30 Amps or so at the higher PAS levels if you’re going up a hill. If you’re brave enough to run your Ludicrous controller at 60 Amps like I’ve been doing then all bets are off. With the highest PAS level you’re going to get closer to 35 Amps on the level and when you lean on the throttle it’s going to try to pull over 55 Amps out of the pack. Unless you’re using Lipos, with the Ludicrous you’re going to start stressing the BMS and cells of most ebike battery packs if you peg and hold the throttle down for extended periods of time. This 7P 52v GA 24Ah 12lb pack is one of the biggest you can buy and runs about $750. It might not fit in some smaller bike frames but it will do 50 Amps all day long. What size pack should I get? This is a hard question to answer. 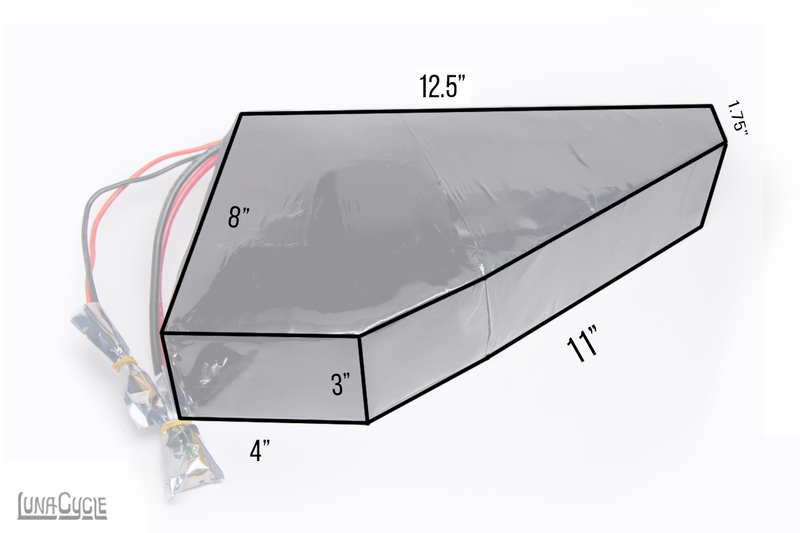 If you’re getting a Ludicrous BBSHD controller I would steer clear of the frame packs and opt for a large 7 or 8P triangle pack made out of high power cells (GA, PF, 25R or 30Q). I have to confess that I’m in love with the GA cells, but they only put out about 8 Amps continuous per cell without getting too hot for my comfort. If you’re running a 7P pack then that means you’re looking at 56 Amps peak continuous output which should be more than enough for most normal ebike builds. If you’re running a very high power build or you want a very small pack then the only cell you should even consider is the 25R cells. These cells are rated for 22Amps continuous draw per cell, but Eric has tested them with a successful burst rate of 100Amps. I’m talking about the rates for a SINGLE cell, not a grouping of cells. If you want a 2P pack that will put out 44 Amps, the only 18650 cell out there that will do it reliably without getting stupid hot is the 25R. I often use my mini cube as a ‘spare tank’ sort of cell so I can get back to my car if my main battery runs out of juice. With the Ludicrous controllers when using the minicube you must be very careful to only use the lower PAS levels and not use the throttle at all. You will put the pack under extreme stress if you start trying to get 55 Amps out of it, and you’re going to kick yourself if you trash a $300 pack because you were a little too eager for more power when you should have been taking it easy. If you buy direct from China be aware that counterfeit 18650s are everywhere. Buy from a reputable source or suffer the consequences. The best time to pick the appropriate pack size for your build is to buy the right pack from the get-go for the build you have. If you have a pack that you want to share between several different builds then get the pack that will have the continuous power output for your most powerful ebike. I bought 4 shark pack mounting frames and throw then on a bunch of different ebikes I have. Although I only have one 30Amp Cont 52v GA shark pack, I use it on several different BBS02 and BBSHD builds. I never use the shark pack on the Ludicrous builds because I don’t want to destroy my $500 pack trying to pull twice the power out of it as what it is able to deliver. Most frame packs are 4P and the GA is an 8Amp cell meaning that it can put out 32Amps continuous pretty reliably. When you start pulling more than that out of the packs, even for a few seconds, the BMS and the cells are both going to heat up quick. It’s very hard to tell how hot your frame packs are because there is a big air space between the cells and the plastic case. I’ve taken apart my NCRb frame pack several times when the outside plastic was only about 10 degrees warmer than the outside air, but once the pack was apart the cells were literally too hot to hold for more than a few seconds (think hot potato). You really don’t want your cells to get this hot. I’m not a big fan of the NCRb cells and if you get a 4P shark pack with NCRb’s don’t expect to run it at more than 25 Amps continuous for several minutes without the pack getting hotter than I would feel comfortable with. In general, I’d avoid buying the NCRb or 26F packs and stick with the holy trinity of GA, PF and 30Q which are all really good cells with decent power density. If you don’t know the continuous Amperage rating of a pack you own then contact the pack manufacturer to find out what it is. You should not buy a battery pack and expect to use the Amperage range between the continuous and peak Amp range except in dire emergencies (like a bear is chasing you). Get the right size pack for your build when you first buy the battery, when in doubt get the pack with the higher continuous Amperage rating, power is addicting and you might want to use that battery for a more powerful build in the future. Know what your continuous output rating of the BMS is before you buy an ebike pack, make sure that the cells can put out what the BMS will allow to be pull for power. Don’t get confused to think of peak power as something that you can easily pull from any pack for extended lengths of time. Peak power on a BMS is only what the cells can deliver and only for a few seconds. Peak power on the controller, on the other hand, is what you want the continuous rating of your ebike pack to be able to provide. Just think before you click the buy button, although frame packs look awful pretty, if you’re pulling more than 30 Amps continuous on your build then you should NOT be using a frame pack, get a large 50 Amp continuous 7P triangle or soft pack instead. The smart consumer reads things like ‘peak power’ on his BMS and battery listings and pretty much ignores it. They do not build a setup that regularly pulls more than the continuous rating of the BMS on the ebike pack. I’m not kidding when I tell you that you will mess up your very expensive 18650 pack when you run your ebike over the continuous amp rating on a regular basis for extended periods. If you don’t abuse your packs they will last a very long time. Don’t be an ebike pack smacker. I enjoyed this article. Thanks for taking the time to explain beginners about battery amps rating. 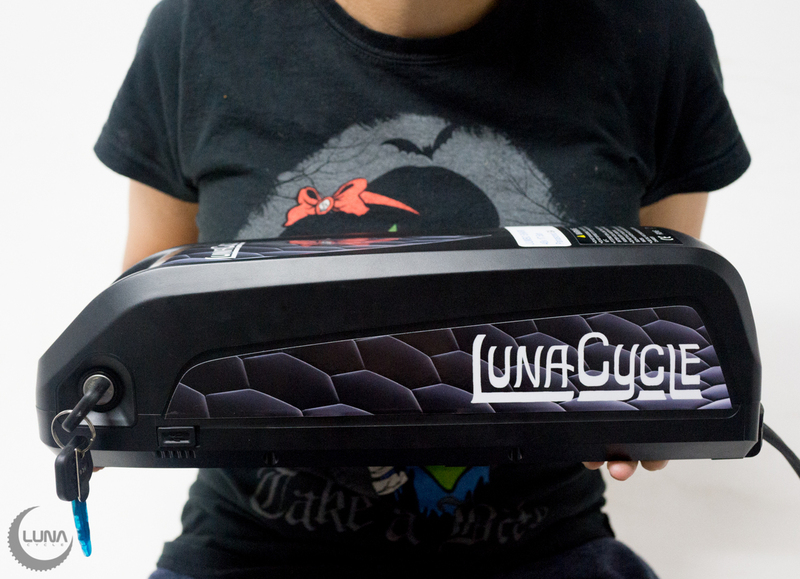 The battery is the most important and most expensive part of an ebike. We might as well make it last for more than a year ! I’m wondering if the Jumbo Shark pack (5p) will feel more powerful than the standard shark pack (4p) during high throttle use on my bbshd, due to less voltage sag? The 52v jumbo pack looks tempting, but unsure if it’s worth it with no power upgrade, only range upgrade. Probably. I’ll post a review in about a week. I’m going to try the 5P shark on the Ludacris 60 amp controller just to see if I can burn out the BMS. You’ve mentioned that Luna is under attack. Luna has a profile for what they want to sell. A lot of it is ‘provocative’ if you just look at Bikes that are ‘legal’. There’s not much interest there, Luna and legal. The Mini pack is a good example. If you are going to put 30 cells in a pack, you could make a 36v battery and it would be a nice little size. I have a 30q pack, the 52v standard Mini. The 52v is all you can get. Thing is, Luna could be selling these Minis into the non-OEM replacement market. I had a factory bike that was 36v. It was relatively easy to jump the wires to the controller and put a connector at that point. Then I could use something like a Mini. I would not have used a 52v battery, but I would have used a 36v. Since the controller was set for 20 amps, it would have been fairly reasonable. I don’t know how many bikes are 36v, 2-6 years old, and semi orphaned because of their batteries. Making jumpers and connectors might be easy for some, difficult for others, but it is a market. I want a small 36v battery. I might go with the GA packs Titan Flight is selling into the RC market, just build a soft pack with connectors, charge them with a basic LiPo type charger. The RC chargers are very nice, very small, very cheap, full featured, run on 12v, let you avoid pesky BMS boards, etc. Maybe I will build a pack with Battery Blocs, which seem reasonable in price. When Luna ignores a lot of the ebike market, the non-performance parts, they are doing more than just pushing performance. They are intentionally ignoring a lot of the market, almost wishing it would go away. We need a Luna for 750 watt ebikes, I guess. Which is fine. No reason to take pot shots at Luna. They do what they do. There may be ideas like Battery Blocs that work. The RC guys are almost certain to migrate to 18650. Maybe some motors will be available for DIY that are too hard to buy right now. The voltage curves of these performance batteries are horrible. My LiPo and LiFePo packs didn’t drop nearly as much. You can do voltage conditioning, just bring the voltage back up, but for your current draws it would be complicated and you have to draw even more amps to get the constant wattage. Cells are cheap, just keep adding rows. I guess. I think you are the best writer on ebikes, even if the subjects aren’t of overwhelming interest to me. Thanks for the compliment George, not sure I agree about being the best writer, but I do enjoy it. Hi George its a good point. we will try to up our 36v offerings in 2017. Unlikely, but thanks for the support. I have a typical eBay 48v 1000w front hub motor kit and just ordered the luna 52v 6ah mini battery. I will only be using my ebike to ride to work which is about a 15 minute walk. I’m hoping this battery will at least work for this kind of commute. Julia, you will have no problem with that set up. More than likely your controlller does not put out many amps. Just put your finger on the battery and make sure its not getting hot and it will be fine. How do you like this motor? Thanks for the great information. This was an in depth answer to a previous question I had in Ludicrous controller article. One more question, I am going to buy another bbshd. Not sure if I would be able to get the Ludicrous controller or not but maybe in a future build. Can you turn the above information into something more practical. I have already ordered my bike when it gets here I will measure but I am pretty sure the batteries in question will work. They are 8p and 7p respectively and both 50 amp continuous and 750 dollars each. What are each suited for? Is one better for the Ludicrous controller? Which are “better” the GA or 25r and is one suited better for a particular application or build and if you could only own one, which one an why? I understand you don’t time to answer everyone’s questions but a practice example of two real life batteries would be helpful. I did read your article and understand the 25r produces 22 amps and the GA only 8, but then how come in this example both batteries are rated at 50amps continuous when I would think the 25r would blow the GA away in continuous power.. I guess I am not getting it. I would go with the GA cells. The 25R would be practical if you were building an ebike that was going to want to do over 50 amp bursts on a regular basis (the 25R cells could support 176 Amps continuous which is insane). The GA cells have much more power density and a 7P pack will still do 56 Amps all day long. Full throttle on a Ludacris controller you’re not going to pull much more than 56 Amps anyway. I have yet to talk to anyone who has a genuine (non-counterfeit) GA pack who is not happy with it. They are great cells. Great article Karl, keep it up. my controller is 9 fet and thus restricted to max cont 30A, so cell’s should be able to handle. i’m currently talking to best tech power, and they requested a parameter about a duration of max discharge , which i’m not sure exactly about how to specify it. so it might be a good idea to over spec your bms , say for example to use a 40a continuous power bms, while in practice you’ll use it for 30 . Doing a bdshd conversion and this is the battery I have chosen. My question. Am I going to blow up my stock bafang engine. Depends on how hard you ride it. If you try to plow through 10 inches of heavy wet crud like I do then you can destroy a nylon gear (I’ve destroyed 2 this year). It’s slightly more likely to melt that gear with a 52v pack. For most applications of this motor I would say no.